Sometimes a good layout and the perfect quote are all you need to showcase those special family photos. Simple, easy to create layouts allow you to keep the focus right where it needs to be: on those important people in your life. Get out your scrapbooking supplies to enjoy a few relaxing moments making a layout to celebrate your family. Digital scrapbooking makes it easy to edit photos taken in poorly lit locations, like a bowling alley. You can choose from lots of different layouts, including multi-photo pages that let you show a special family event from all angles or over a period of time. Add digital embellishments like stickers, headings, and more to give your layout a totally professional feel. Keep a camera handy during weekend road trips, since these can be the best times to get great material for your family scrapbook or travel memory book. Create a layered layout that shows off all aspects of your family vacation, from the hotel you stayed at to the exciting things you saw. Including several photos is a great way to tell the story of your trip, and be sure to add a section for journaling about your family experience. If you go someplace, such as an aquarium, a museum, or the zoo, it's great to include a layout combining what you saw with photos of people looking at the exhibits. Down one side of the page, place several photos showing animals or items you saw. Then use a border to divide the page, and on the other side, place a photo of everyone looking at the exhibits. Be sure to include space for journaling. This is a great way to tell the story of your family adventure. Birthdays are always fun to scrapbook, but it can be a little challenging to show the celebration for adult members of the family. The key is telling the story in a series of photos and then showing those photos to the viewer in order. That way, the viewer can feel like they are at the celebration! Add some great borders to help highlight the pictures and give the page a really celebratory feeling. Anniversaries are also an important family event, especially big celebrations that involve the whole extended family. The key to capturing this type of celebration in a layout is to focus on the whole family in one larger photograph and then add in smaller images of individual family members or groups. Really show off the larger photo with borders and embellishments, and then use a border to separate the several smaller shots. You'll find this paints a picture of the whole celebration. Bright colors and bold patterns add impact to any layout, and that's especially important for those that don't naturally lend themselves to themes like birthdays or holidays. These ordinary days are important to capture too, and you can add visual interest by using a great patterned paper, layered with a bright solid. Add a few borders and some room for journaling, and you have an awesome layout. A collage of photos makes a simple title page for your album, and it's fun to make this page after you've created the rest of the album. That way, you'll have a sense for the themes and colors you want to use. 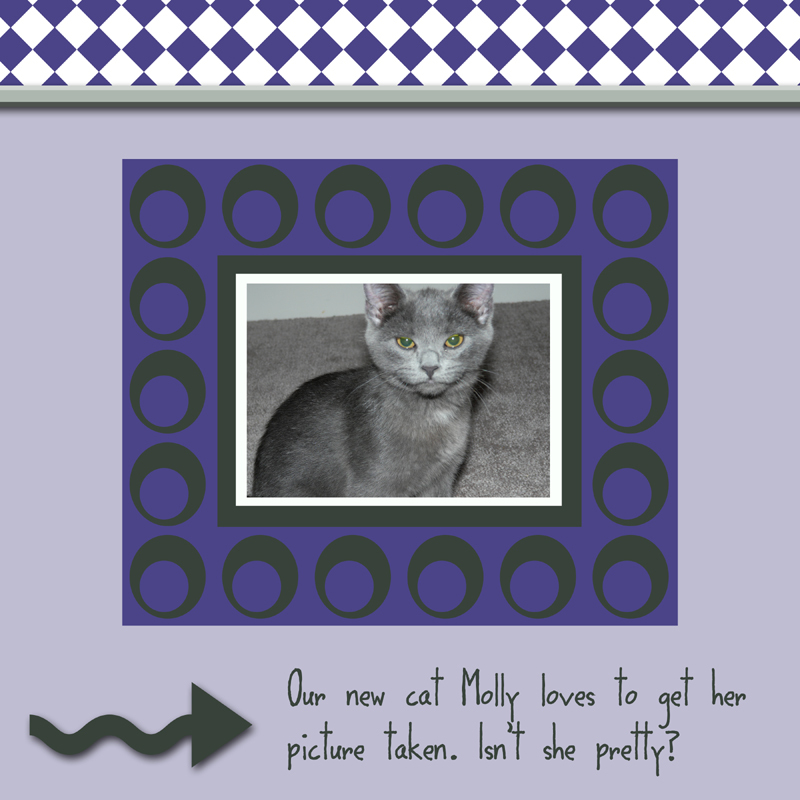 Create a center element with the album's title and some great embellishments. Then add lots of images at the top and bottom of the page to highlight great moments. Turn your collection of layouts into a beautiful hardcover book by learning how to make digital scrapbooking pages into bound albums.